Military forces around the world have all kinds of badass vehicles, but bomb-detonating tanks are definitely among the most impressive. These massive powerhouses basically roll around pummeling the ground with hammers to detonate any leftover land mines and other buried explosives. 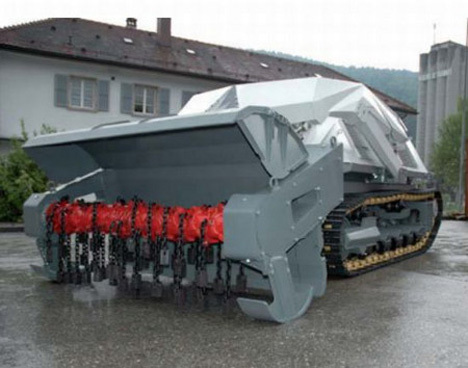 This particular tank is called the Digger D-3 Flail Tank, and it has the benefit of being remotely controlled. The fact that the operator isn’t even in the tank makes it reasonably safe for military personnel. The video above shows the previous model, the Digger D-2, but the basic operation is the same. Heavy weights spin around on a chain to trigger any underground explosives and render them harmless to people who live in the area. In countries where wars have raged for generations and in countries where wars have come and gone generations ago, buried explosives are a terrifying threat. Deploying bomb-detonating tanks can remove the danger and make it safe to walk without fear of landmines. See more in Mods & Custom or under Transportation. August, 2011.